Barren broodmare. Dam of 4 previous foals. 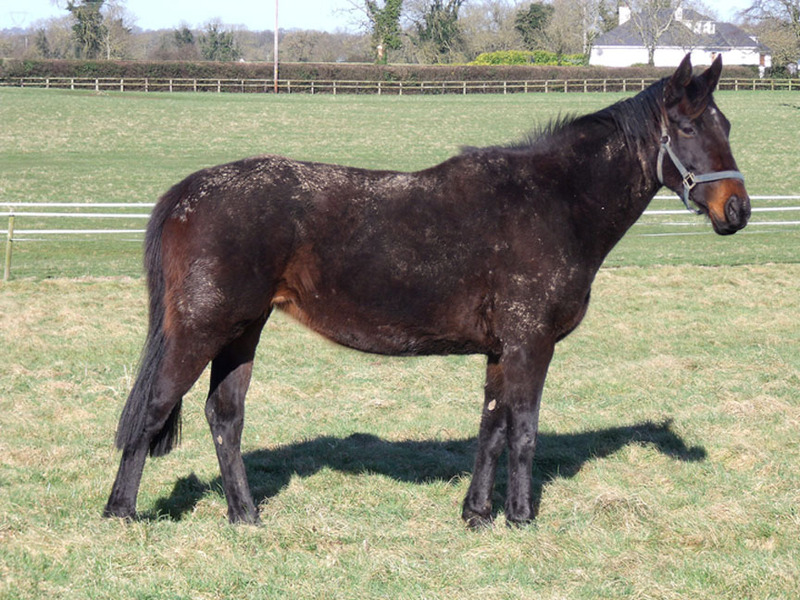 Full sister to High Society dam of multiple Gr 1 winner SOCIETY ROCK (Betfred Sprint cup 2012 + Golden Jubilee St 2011). SOCIETY ROCK (IRE): 5 wins at 2 to 5, 2012 and £761,526 inc. Golden Jubilee S., Gr.1, Betfred Sprint Cup, Gr.1 and Cleanevent Pavilion S., L., placed 2nd Golden Jubilee S., Gr.1, Prix Maurice de Gheest - Goldikova, Gr.1, Carnarvon S., L., 3rd Darley July Cup, Gr.1 and Totepool S., Gr.2. Melandia (IRE): 2 wins at 3, 2011 in Greece and placed 3 times. Byron Blue (IRE): winner at 3, 2012 and placed 3 times. Desert Riches (IRE): 6 wins in Greece and £24,839. Elizabeto (IRE): 5 wins at 3 to 5 in France and in Spain and £31,827. Mr Mister (IRE): 2 wins viz. winner at 3 and placed; also winner in Macau. MUHIM: 8 wins at home and in Hong Kong and £159,122 inc. Queen Elizabeth II Cup, L., placed 2nd Hong Kong Gold Cup, L.
Moulton Sky (IRE): 10 wins in Germany and £67,106 and placed 11 times. Aristocrat Velvet: 2 wins at 2 and placed 9 times. Indigo Time (IRE): 2 wins at 2 and 3. Gust of Shirley: unraced; dam of winners; grandam of MACIUCHINA (ITY) (won Premio delle Debuttanti Hurdle, L.). Mirage (JPN) (winner in Japan, 3rd Musashino S., L.). Maurizio di Nassau: winner, 3rd Grand Criterium de Bordeaux, L..